Recently, two excellent historical resources on the proceedings of the Parliament of Canada have become readily available online. Many of you would join me in finding them useful and interesting. First, the historical debates and journals of the House of Commons and of the Senate from 1867 to 1993 (the 1st Parliament to the 34th Parliament) are now available online, in both official languages. Second, the Cable Public Affairs Channel, CPAC, has done us a great public service by posting online the entirety of its archive of the televised proceedings of the House of Commons, from their debut in October 1977 (the 30th Parliament) to 2017 (the 42nd Parliament). We can now easily access these 40 years’ worth of televised debates of proceedings of the House of Commons. If you type “House of Commons Debates — xMonth yDay, zYear” in the search bar of the video archive, you can watch for yourself these 40 years of our political history. We were one of the first countries (if not the first) in the world to start broadcasting the proceedings of its lower house on television. C-SPAN did not start televising the US House of Representatives until two years later, in 1979. I had a bit of fun with this earlier and watched the downfall of the ill-fated Clark government on 13 December 1979, which I mentioned in my previous entry. 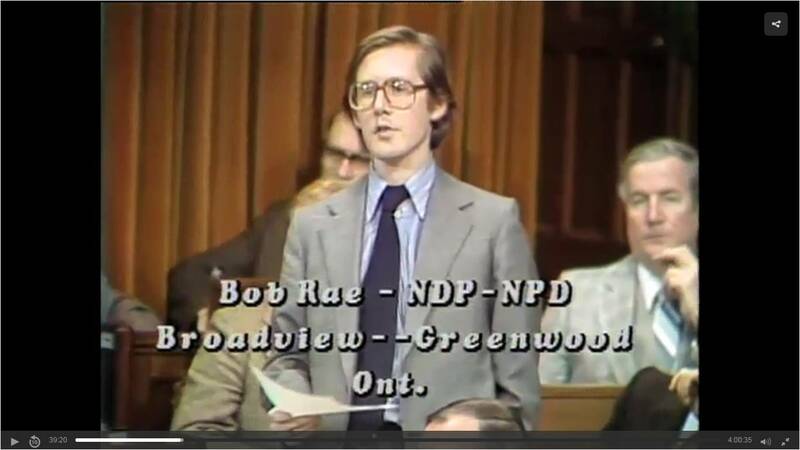 A young Bob Rae had introduced the New Democratic Party’s amendment to Finance Minister Crosbie’s budget that brought down the government on 12 December 1979. I noticed that in the 1970s and 1980s, the cabinet and shadow cabinet actually looked at each other when they posed and responded to questions. Strictly speaking, they still addressed the Speaker of the House by referring to their colleagues in the third person in most cases — though they did sometimes slip in the second person and say “you” –, but in reality, they were talking to one another because they were looking at one another. Frankly, I’d prefer to return to that custom. Stephen Harper demonstrated a certain contempt for his colleagues on the opposition desks by literally addressing all his remarks to the Speaker, ostentatiously turning himself toward the Speaker’s chair and buttoning up his jacket whenever he stood up, and refusing to look members opposite in the eye. Not surprisingly, Brian Mulroney provides a distinct contrast. On 11 December 1985, around 29:00, Prime Minister Mulroney slipped into the second person, and you can see that he alternates between looking at the Speaker, Liberal MP Lloyd Axworthy who had asked him a question, and other members of the House. Dale Smith has noted that our House of Commons lacks the British debating culture of witty banter and is instead characterized by crassness. This is certainly true today, but it probably wasn’t true in the 1970s and 1980s. Anyway, have fun geeking out over the archives! This entry was posted in Parliament, Traditions and History. Bookmark the permalink.